There is a note on Mildred's 1922 passport application that states the divorce was filed with the Supreme Court of New York in Kings County. Burney Oslin Jackson was a student at Cornell when he eloped to New Hampshire with Mildred Peshmalyan, a student at Vassar. Their car broke down twice on the way and they were forced to return home, only to take the train the following day. They divorced just 5 years later. 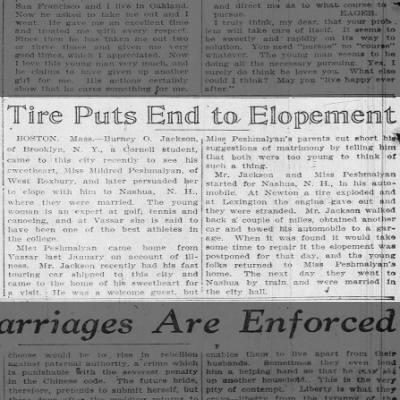 A Burney O. Jackson married Elsie V. Goetting in 1915, just 2 days after his divorce to Mildred. While it is possible it was a different Burney, it is too much of a coincidence so it is recorded here. Shortly before his death in 1951, Burney and Aileen A. Jackson obtained a marriage license in New York. It is unclear whether they had previously officially wed before this time, or this was a re-marriage after a divorce. It is assumed they married sometime before the birth of their 2 sons. The "New York State, Marriage Index, 1881-1967" also records another marriage for Burney O. Jackon, this time to Joan M. Mehling on 26 Apr 1951 in Hempstead, NY. It doesn't seem possible that the same Burney could marry Joan in April, get divorced, and then marry Aileen, all within a 4-month span. There is a Burney Orist Jackson [1911-1983] on Findagrave and the U.S. Social Security index. He would have been too young to marry Elsie, but could account for the marriage to Joan in 1951. However, this Burney is married Grace Dickson in 1936 and is buried next to her in Texas. [S204] U.S. World War II Draft Registration Cards, 1942, Ancestry.com, (Name: Ancestry.com Operations, Inc.; Location: Provo, UT, USA; Date: 2010;), The National Archives at St. Louis; St. Louis, Missouri; World War II Draft Cards (Fourth Registration) for the State of New York; Record Group Title: Records of the Selective Service System, 1926-1975; Record Group Number: 147; Box or Roll Number: 294. [S175] World War I Draft Registration Cards, 1917-1918, Ancestry.com, (Name: Online publication - Provo, UT, USA: Ancestry.com Operations Inc, 2005.Original data - United States, Selective Service System. World War I Selective Service System Draft Registration Cards, 1917-1918. Washington, D.C.: National Archives and Records Admini;), Registration State: New York; Registration County: Kings; Roll: 1754393; Draft Board: 47. [S325] 1940 United States Federal Census, (Name: National Archives and Records Administration;), Year: 1940; Census Place: Hempstead, Nassau, New York; Roll: m-t0627-02688; Page: 20B; Enumeration District: 30-154. [S185] 1930 United States Federal Census, (Name: National Archives and Records Administration;), Year: 1930; Census Place: Kearny, Hudson, New Jersey; Page: 2B; Enumeration District: 0319. [S551] New York, State Census, 1915, Ancestry.com, (Name: Ancestry.com Operations, Inc.; Location: Provo, UT, USA; Date: 2012;), New York State Archives; Albany, New York; State Population Census Schedules, 1915; Election District: 20; Assembly District: 09; City: New York; County: Kings; Page: 12. [S179] 1910 United States Federal Census, (Name: National Archives and Records Administration;), Year: 1910; Census Place: Brooklyn Ward 29, Kings, New York; Roll: T624_983; Page: 8A; Enumeration District: 1019; FHL microfilm: 1374996. [S186] 1900 United States Federal Census, (Name: National Archives and Records Administration;), Year: 1900; Census Place: Wheaton, Montgomery, Maryland; Page: 6; Enumeration District: 0066. [S548] New York, Death Index, 1880-1956, Ancestry.com, (Name: Ancestry.com Operations, Inc.; Location: Lehi, UT, USA; Date: 2017;), New York Department of Health; Albany, NY; NY State Death Index; Certificate Number: 62433. [S552] Missouri, Jackson County Marriage Records, 1840-1985, Ancestry.com, (Name: Ancestry.com Operations, Inc.; Location: Provo, UT, USA; Date: 2015;). [S546] Newspapers.com - Oakland Tribune - 09 Jun 1910, Thu, (Name: Oakland Tribune; Location: Oakland, California; Date: 09 Jun 1910, Thu;), 09 Jun 1910, Thu. [S554] New Hampshire, Marriage and Divorce Records, 1659-1947, Ancestry,com, (Name: Ancestry.com Operations, Inc.; Location: Provo, UT, USA; Date: 2013;), New England Historical Genealogical Society; New Hampshire Bureau of Vital Records, Concord, New Hampshire; New Hampshire, Marriage and Divorce Records, 1659-1947. [S184] U.S. Passport Applications, 1795-1925, Ancestry.com, (Name: Online publication - Provo, UT, USA: Ancestry.com Operations, Inc., 2007.Original data - Passport Applications, 1795–1905. NARA Microfilm Publication M1372, 694 rolls. General Records Department of State, Record Group 59. National Archives, Washington, D.C;), National Archives and Records Administration (NARA); Washington D.C.; Roll #: 2075; Volume #: Roll 2075 - Certificates: 209476-209849, 02 Aug 1922-03 Aug 1922. [S550] Rhode Island Town Marriages Index, 1639-1916, (Name: FamilySearch;), Burney Oslin Jackson and Elsie Veronica Goetting, 19 Jul 1915; citing Providence, Providence, Rhode Island, United States, town halls, Rhode Island, and Rhode Island Historical Society, Providence; FHL microfilm 455.